Mandrake - White Buffalo Trading Co.
Long famous among witches well before the Harry Potter books made this magical plant a household word. A large root system hides under a fairly small head, which dies down in Spring and re-sprouts in Fall. Prefers a colder climate, such as England, France or Germany. Does well in the northern latitudes of the continental USA which have a colder winter, and into southern Canada. 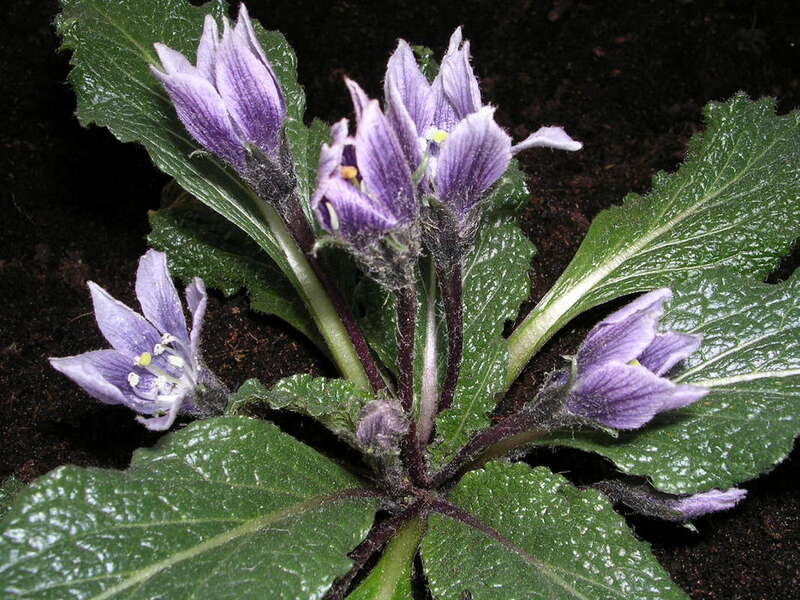 In the past, mandrake was often made into amulets which were believed to bring good fortune, cure sterility, etc. 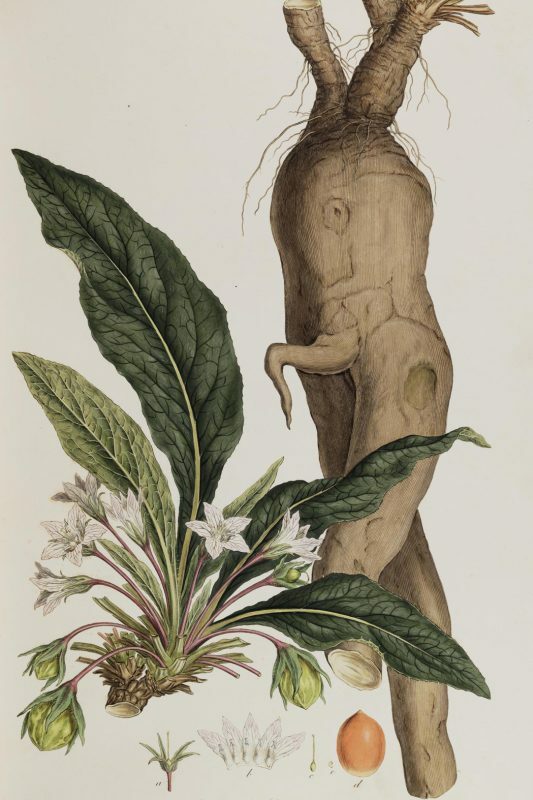 In one superstition, people who pull up this root will be condemned to hell, and the mandrake root would scream as it was pulled from the ground, killing anyone who heard it. Therefore, in the past, people have tied the roots to the bodies of animals and then used these animals to pull the roots from the soil, be that a horse, pig or dog. In sufficient quantities, mandrake induces a state of unconsciousness and so it was used as an anesthetic for surgery in ancient times. In the past, juice from the finely grated root was applied externally to relieve rheumatic pains. It was also used internally to treat melancholy, convulsions, and mania. 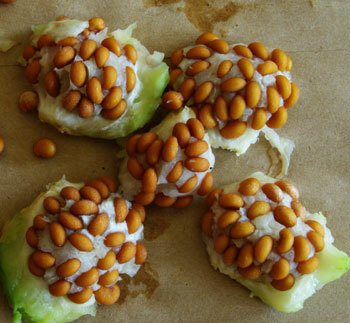 If the seeds are very dry, you may need to soak them in warm water. They are ready when they sink to the bottom of your cup. 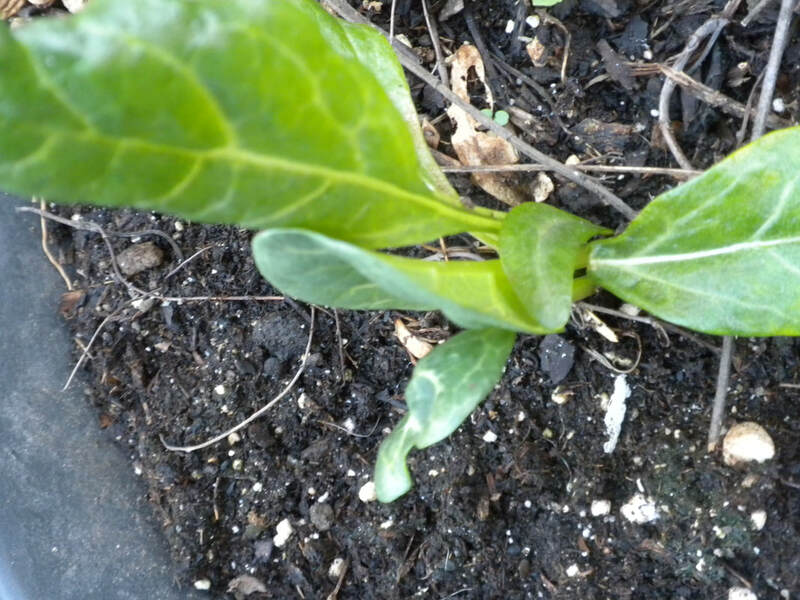 The Mandrake is a cold-germinator, so best results come from a period of cold stratification. The seeds must be kept cold for a period of some weeks (in the refrigerator), and sown in the spring or fall. 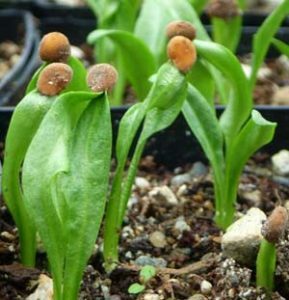 Allow up to one year for full germination. Dry ungerminated seeds and then water again to get the second germ going. Mix the seeds with damp sand in a plastic bag. The sowing must be kept warm, about 70°F and moist for the first 2-4 weeks. (Too moist will rot the seeds.) After this period place it in your refrigerator at a temperature of 39°F for 5 to 6 weeks. After that take the bag out and keep it at room temperature. Check for sprouted seed regularly. Part shade to full sun, light water. Allow one year. Plant in sandy soil, full sun, water well until established. But large roots will rot in standing water or moist soil. "I blended a starting medium (one part sand and one part seed starter mix), evenly pressed the mix into a soil block tray, and sowed 45 fresh mandrake seeds, all from one fruit. I lightly dusted lime over the starting medium (root crops prefer soils with a higher pH level) and secured another tray on top; germination could take months and critters searching for food would dig through the tray if left open. We placed the tray outside in a cool location under a shady oak with hopes that this batch would yield us a handful of mandrake seedlings, and throughout the late summer and early fall, I would peek to see if there was any activity. Feeling a little skeptical, we tucked the tray off to the side of our outdoor space, with other plants, for the entire winter. In order to keep the cycle of seed production and reproducing optimal, all seeds are sensitive to their environment and know the best time to germinate. 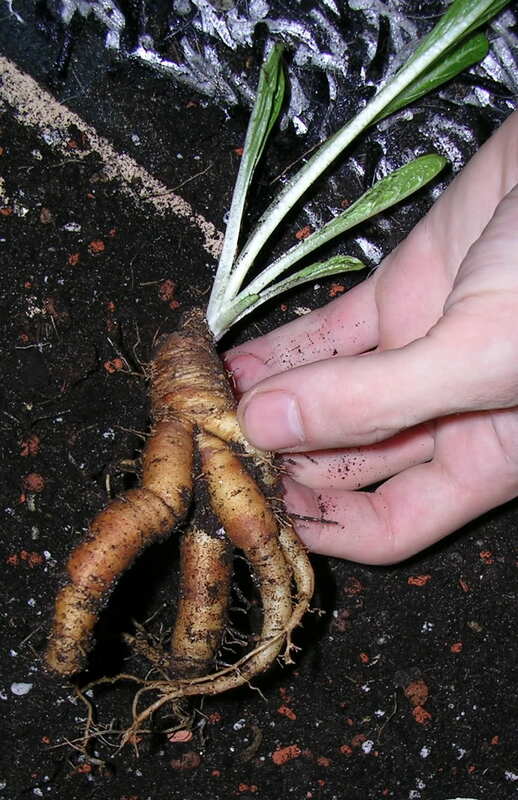 Mandrake seeds biologically need to experience the moisture of snow and low temperatures of winter to go through a process called cold stratification—a period of moist cold. So, this winter may not have been ideal to us, but it was perfect for these seeds. As the March days warmed and daylight lengthened, we were happy to find that we had a full crop of 35 mandrake seedlings." "Would you like to make a Mandragora, as powerful as the homunculus (little man in a bottle) so praised by Paracelsus? Then find a root of the plant called bryony. Take it out of the ground on a Monday (the day of the moon), a little time after the Vernal Equinox. Cut off the ends of the root and bury it at night in some country churchyard in a dead man's grave. For 30 days, water it with cow's milk in which three bats have been drowned. When the 31st day arrives, take out the root in the middle of the night and dry it in an oven heated with branches of verbena; then wrap it up in a piece of a dead man's winding-sheet and carry it with you everywhere."